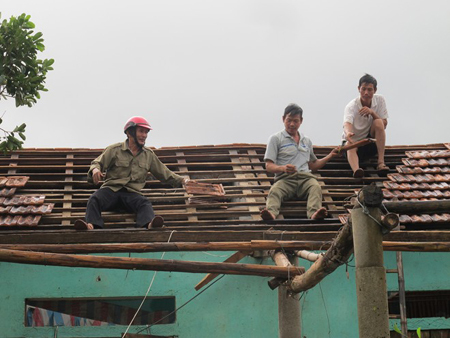 QUANG BINH (VNS) — A whirlwind uprooted dozens of roofs of houses in the central Quang Binh province early this morning. Strong winds damaged a number of banana plantations which were about to be harvested, and also knocked down dozens of rubber trees. Local authorities had mobilised forces to urgently help affected residents, Nguyen Duc Truong, chairman of the People's Committee of Nong Truong Viet Trung town said. Due to the heavy rain, at first, the authorities would help repair partly damaged of houses, while houses with the entire roof blown off would be covered with canvas, he said.